[159 Pages Report]The global metal biocides market is projected to reach USD 3.49 billion by 2021 at a CAGR of 4.8% from 2016 to 2021. The market is driven by the increasing growth of its major end-use industries, such as, paints & coatings, medical, and water treatment. Paints & coatings industry in the Asia-Pacific region is estimated to grow at a CAGR of 6.0% from 2016 to 2021. Rising population pressure and robust industrial growth are the key driving factors for the market on domestic as well as commercial front. Moreover, the region currently accounts for around 50% of the global consumption of paint & coating industry. The demand for metal biocides is the highest in this industry. Therefore, future demand for metal biocides in the region is also estimated to grow at a faster rate. 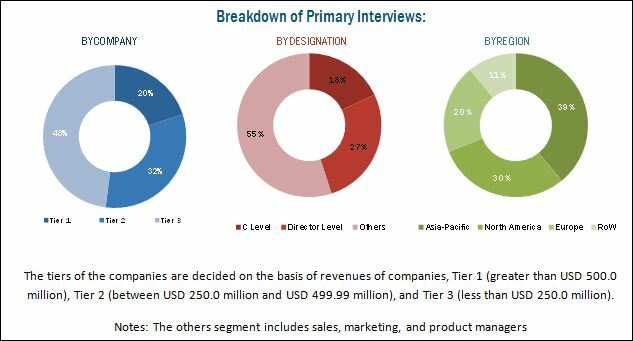 Both, the top-down and bottom-up approaches have been used to estimate and validate the size of the global metal biocides market and to estimate the size of various other dependent submarkets. Extensive secondary sources, directories, and databases such as Hoovers, Bloomberg, Chemical Weekly, Factiva, the Biocides and Biosciences Group (BBG), European Commission, Securities And Exchange Commission (SEC), and other government and private websites were involved in order to identify and collect information useful for this technical, market-oriented, and commercial study of the global metal biocides market. The metal biocides value chain includes raw material manufacturers, metal biocide manufacturers, and end-users. The leading plyers profiled in this study include, BASF SE (Germany), Clariant AG (Germany), The Dow Chemical Company (U.S.), SANITIZED AG (Switzerland), Lonza Group Ltd (Switzerland), Troy Corporation (U.S.), Milliken Chemical Company (U.S.), SteriTouch Ltd. (U.K.), Noble Biomaterials, Inc. (U.S.), and Renaissance Chemicals Ltd (U.K.). In May 2016, BASF SE has launch zinc oxide based biocide under its Z-Cote brand. This product is specially designed to be used for all kinds of formulations from skin care and sun care to decorative cosmetics. In April 2014, Clariant AG has introduced an antimicrobial master batches named CESA antimicro for foot wear industries. This metal biocide will provide protection against odor-causing bacteria in shoes, boots, sandals and other footwear made with polymeric insoles. In May 2015, DOW Microbial Control, a division of The DOW Chemical Company collaborated with Strategic Partners, Inc. (U.S.A.) to develop medical scrubs and lab coats which will use SILVADUR Antimicrobial which will help inhibit the growth of bacteria on apparel and increase the life of garments. This research report categorizes the global metal biocides market on the basis of form, end-use industry, and region. What are the upcoming trends for metal biocides market in developing nations? The global metal biocides market is projected to reach USD 3.49 billion by 2021 at a CAGR of 4.8% from 2016 to 2021. The market is primarily driven by the rapid growth of the key end-use industries, such as paints & coatings, medical, and textile. Metal biocides are used in end-use industries such as, paints & coatings, medical, textile, pesticides (agriculture), wood preservation, foods & beverages, and others. In 2015, the medical sector accounted for the largest market share among the end-use industries, in terms of value. Whereas, the paints & coatings segment is expected to register the highest CAGR, during the forecast period. The growth of this segment is primarily attributed to the increasing demand for metal biocides in household paints, varnishes, marine antifouling agents, and so on, due to their effectiveness in inhibiting the growth of algae and fungi on applied paint. Based on type, the metal biocides market is segmented into silver, copper & alloys, zinc, and others. In 2015, the silver-based metal biocide was the largest segment among all types. Moreover, this segment is expected to register the highest CAGR, during the forecast period. The growth of this segment is supplemented by the non-toxic, environment friendly and sustainable nature of silver biocide. Despite the high cost, silver biocide is widely used in the healthcare industry owing to its high thermal stability, effectiveness, unsurpassed safety, and the fact that it is approved by the Environment Protection Agency (EPA). The Asia-Pacific region, North America, Europe, and rest of the world are the main metal biocides markets considered for the report. The North American region is leading the global metal biocides market, both, in terms of volume and value. 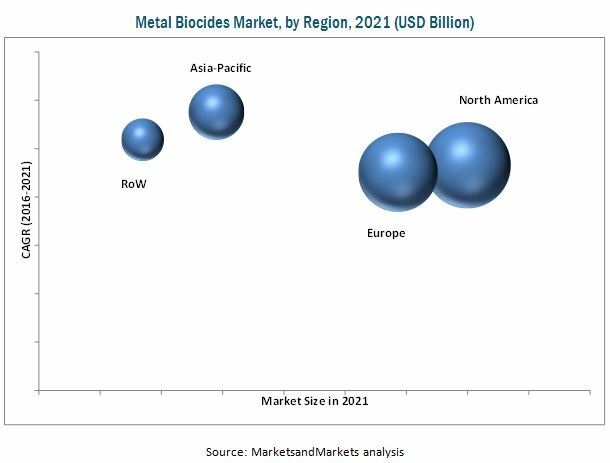 The rising demand for metal biocides in this region is mainly driven by the presence of key market players such as, The Dow Chemical Company (U.S.), Troy Corporation (U.S.), Milliken Chemical Company (U.S.), and Noble Biomaterials Inc. (U.S.). Intense competition among the major players in the market has led to price stabilization in the past few years. The growing demand for metal biocides in the medical and foods & beverages industries in the U.S. is driving the metal biocide market in the region. The global metal biocides market is growing at a moderate rate. Stringent regulations for the production and consumption of metal biocides, coupled with the requirement of high capital investments are the key factors restraining market growth. 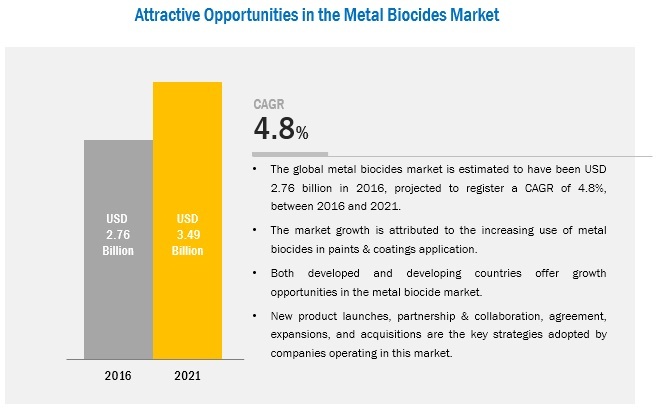 These factors create a huge entry barrier for new entrants in the global metal biocides market, which in turn discourages competition and lowers overall market growth. Metal biocides are used in many applications such as paints & coatings, medical, textiles, and others. Exterior coatings: Environmental exposure causes development of airborne algae and fungi in exterior applications. In such cases, biocides that are UV stable and less soluble in water are effective for long term stability. Interior coatings: Mold contamination takes place in internal coating based on humidity of rooms (kitchens, bathrooms). Biocides applied in such cases should have the property of low solubility in water and protection against mold. Utility of silver and copper biocides in medical industry is already a proved fact. Both silver and copper-based biocides are used for coating of medical devices to inhibit the growth of bacteria and fungi for a long period of time. Moreover, the ongoing researches are finding their use in more number of applications in the same field. Clinical researches have proved that copper and alloys are effective against several viruses, such as influenza A viruses, methicillin-resistant Staphylococcus aureus (MRSA), and E. Coli O157:H7. Silver-based biocide has commercial usage in the textile industry due to its antimicrobial quality. It is estimated that in North America and Europe, both silver and copper biocides are gaining importance in terms of usage in regular clothing as well as medical textile. BASF SE (Germany), Clariant AG (Germany), The Dow Chemical Company (U.S.), SANITIZED AG (Switzerland), Lonza Group Ltd (Switzerland), Troy Corporation (U.S.), Milliken Chemical Company (U.S.), SteriTouch Ltd. (U.K.), Noble Biomaterials Inc. (U.S.), and Renaissance Chemicals Ltd (U.K.) are the leading companies, with an excellent foothold in the global market. These companies are expected to account for a large market share in the near future.